PUTNEY, VERMONT - Next Stage Arts Project is thrilled to present Naomi Shelton & The Gospel Queens on Saturday, March 21st at 7:30 pm. 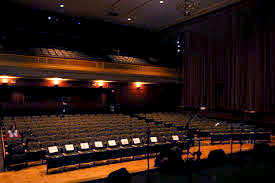 This is the fourth concert in Next Stage’s Shades of Blue series, sponsored by Brattleboro Subaru and WKVT. 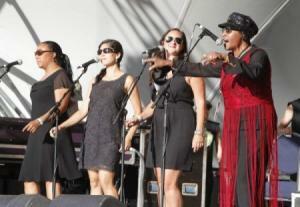 In the six years since the release of their last full-length record, Naomi Shelton & the Gospel Queens have toured extensively, playing main stages at some of the most prestigious festivals in the world, including Bonnaroo, The Monterey Jazz Festival, Montreal Pop and The Ottawa Blues Festival. 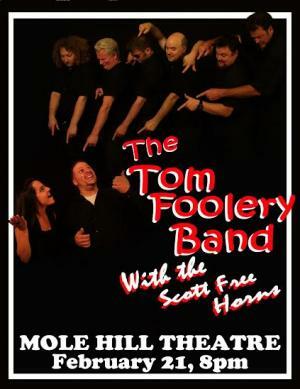 ALSTEAD, NEW HAMPSHIRE - Tonight, Saturday Feb 21, at the Mole Hill Theatre its the Tom Foolery Band also featuring the Scott Free Horns. This 9-piece band includes a 3-piece horn section and provides a little something for everyone. The Tom Foolery Band covers chart toppers and dance hits from the past 50 years, Funk, Classic Rock, Disco, Motown...all delivered in the fun TFB way! This band's been around and proven their chops, but this is your first chance to see them at Mole Hill. Expect a great event! CLAREMONT, NH—A new photographic exhibit will be opening on Thursday, March 5, in the John D. Bennett Atrium Gallery in the Claremont Opera House. The exhibit will feature the works of Phyllis A. Muzeroll, the publisher and editor of the e-Ticker News, and Bill Binder, staff photographer and reporter for the e-Ticker News. Entitled “News And Views: A Study Of The Worlds Around Us”, the combined exhibit will feature both news photos and a collection of aesthetic photos taken by both Muzeroll and Binder. 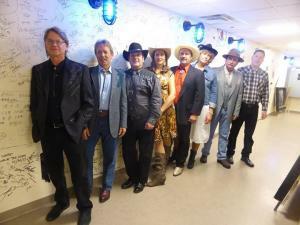 The performance features the music of Hank Williams, Patsy Cline, Johnny Cash, Tammy Wynette, Merle Haggard, Loretta Lynn, Willie Nelson and more, performed by a talented cast who have performed with some of country music’s most popular artists. The music in the show runs the gamut from poignant love songs, to all-out hoe downs and everything in between. 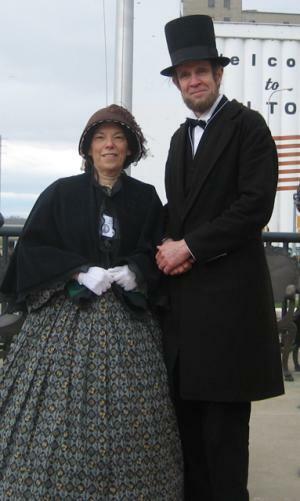 CLAREMONT, NEW HAMPSHIRE - The Claremont Opera House, with a grant from the New Hampshire Humanities Council, will present Abraham and Mary Lincoln: the Long and the Short of It, a living history program by Steve and Sharon Wood of Claremont, on Friday, Feb. 20 at 7pm. ALSTEAD, NEW HAMPSHIRE - On Friday, February 15,the Mole Hill Theatre in Alstead, New Hampshire will present Love Letters, the Pulitzer Prize finalist fro drama and written by A. R. Gurney. This dramatization features Barb-Neff Davis and John W. Luther. 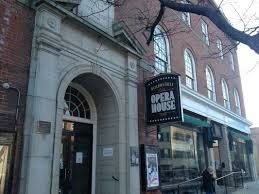 ALSTEAD, NEW HAMPSHIRE - Tonight, The Mole Hill Theatre is putting the "Rah" back in Mardi Grah! New Orleans Cajun Creole Swamp Pop from Bayou X! Carnival ~ dress up ~ celebrate! Potluck dinner at 7:00 and music begins at 8:00. 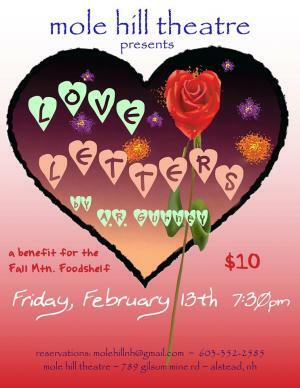 Friday Feb. 13 ~ Love Letters a play by A.R. Gurney. A benefit for the FM FoodShelf! 7:30. reservations recommended.